This Middle Atlantic DWR Sectional Wall Mount Rack DWR-10-17PD (Black) is a 10U rack designed for 19" wide equipment. It features the trademarked "Tool-Free Quick-Mount" system, which allows one-person mounting and installation. Its welded-steel construction supports up to 200 lb. and adjustable 1/8", 10-32 threaded front rack rails make positioning your equipment a snap (rear rack rails are optional). 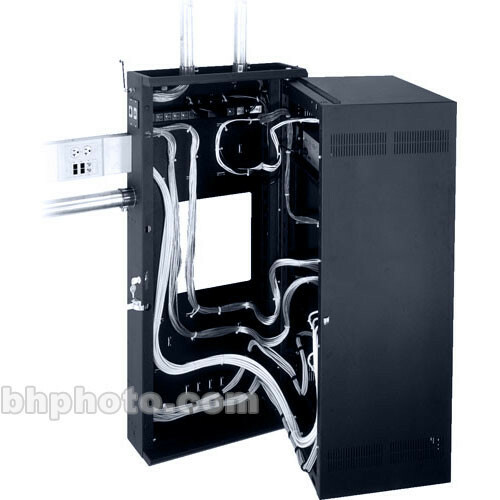 This rack offers unsurpassed cable management features. Abundant, built-in cable lacing points and touch-fastener tie points allow you to organize any quantity of cables. And numerous knockouts on the top, bottom, and back offer numerous pass through points for cabling. The top and bottom of the rack include 1/2", 3/4", 1", 1-1/2", 2" and 3" electrical knockouts and a 5/8" knockout for UHF/VHF antenna. The backpan features a 12-1/2" x 12-1/2" laser knockout opening for an electrical pull-box. And the side offers 2" and 4" knockouts for Wiremold 4000 Series raceways and UCP series universal connector panels. Laser knockouts in the center section, top, and bottom accommodate up to four (4) 4-1/2" fans. Hinges may be mounted for left or right opening accessories. The optional front-mounted "Zero Clearance Latch" saves wall space by allowing wall racks to be placed side-by-side or in a corner, eliminating issues with side clearance. This rack's backpan includes raised embosses to mount power products or other accessories. This model comes fully assembled with a plexi-front door. Middle Atlantic's trademarked "Tool-Free Quick-Mount" system allows for easy, one-person mounting of this rack. Built-in cable lacing points, touch-fastener tie points, and numerous knockouts allow you to organize any quantity of cables. A variety of accessories allow you to personalize your rack to meet your exact needs: doors, fans, latches, rear rack rails, and more. Rack rail is labeled in EIA standard rack space increments allowing for easy equipment alignment. Pre-installed washers on all 10-32 threaded racks crews save installation time. This product has been UL (Underwriters Laboratories) Listed in the United States and Canada. Dimensions (WxHxD) 23-3/8 x 24-9/16 x 17"
Box Dimensions (LxWxH) 24.0 x 23.5 x 21.0"